Whether or not you spend most of your time "writing" on a computer or mobile device, pens still have their rightful place in all of our lives. We've all had issues with buying pens that run out too quickly, scratch the paper, produce writing that doesn't look right or just don't feel comfortable in our hands - so with those issues in mind, how can you choose the perfect pen to suit your needs? The first step is to choose the type of pen that you like best. Ballpoint pens are great for all manner of writing surfaces, while rollerball pens are similar but require less pressure and the ink takes longer to dry. Gel pens look like rollerballs but dry faster and are great for shiny or dark surfaces, while fountain pens can improve your handwriting and feel far more luxurious. Ultimately, it's up to you to choose the type you feel most comfortable with. Secondly, you should decide whether you want a fine point or medium point pen, with the former being better for clarity for those with small writing, the latter for everyday use. You will also need to decide whether you are interested in buying a pen that is disposable, or one that can be refilled. Disposable pens are convenient and will not cause concern if they are lost or break, but refillable pens can be very affordable. On the topic of affordable pens, it is also important to set a budget for your pen so that you can more easily work out what you can get for your money. You may end up choosing between multiple cheaper pens or one more expensive option - the decision depends on your needs. Your needs are incredibly important, in terms of how you will use the pen. If you are looking for something to be used at work, you may wish to opt for a design that is smarter and more formal, in order to make you look more professional. If you are meeting customers, speaking with suppliers or dealing with members of the public, you'll no doubt want to be using a pen that looks like you mean business. If your new pen is just for personal usage, a simple plastic pen will probably do the job perfectly. The look and style that you opt for will probably also have some bearing on how the pen feels in your hand; comfort is key, especially if you will be writing for long periods of time. 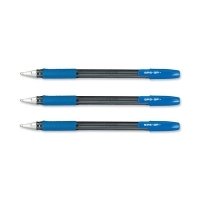 Decide whether or not you need a grip for added comfort, and whether you prefer a pen with a thinner or a thicker body. Once again, there is no right or wrong answer here, it's simply a case of working out what's right for you. Finally, you should choose a pen that works in a way that suits your personality. If you're clumsy or prone to losing things, a pen without a lid is probably the sensible choice. If you distract others by clicking pen buttons, opt for a twist mechanism instead. While it may seem like a lot to take into consideration, following these steps will ensure that you have the perfect pen in no time at all. Carl Barton is a director of Office Allsorts who has worked in the office products industry for 15 years.